Director Kyle Fabel is responsible for the perfect casting, interweaving and maneuvering the marvelous actors who whirl through Herb Gardner’s A Thousand Clowns on the Berkshire Theatre Festival’s Fitzpatrick stage, where a prat fall is nothing, only a prone position is an expectation. 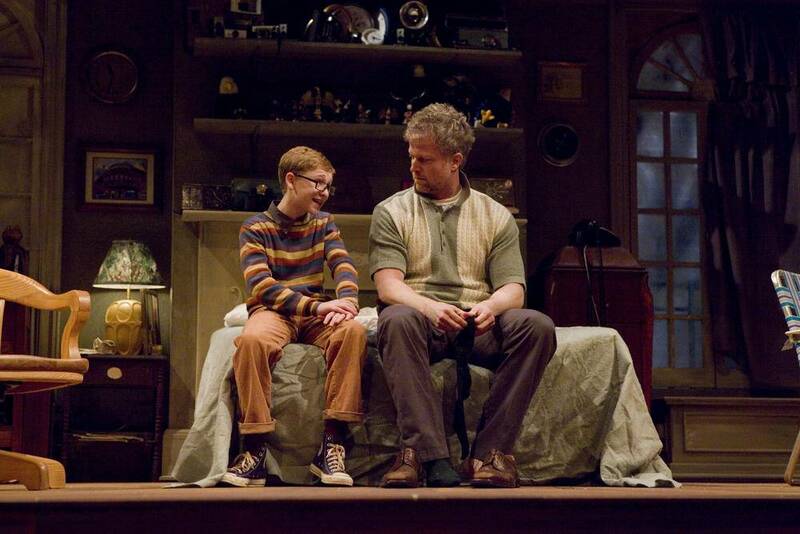 The play is an endearing poignant comedy. Every character in it is real. And human. Flawed but hanging in. Agile, hysterical, trapped in situation and personality. The plot centers around Murray (C J Wilson), a day dreamer who walks off his job as joke writer for for a kids TV show about a Chipmunk and in so doing risks losing custody of his young precocious nephew Nick (Russell Posner), and in come more clowns, the social workers to join those already on stage. Murray who sets it all in motion keeps the plot a-boil with his dry humor, one liners, his over powering need to keep his apartment full of lovingly collected junk and his more over-powering love for his twelve year old nephew who has a few foibles of his own. He is trapped between his hate of sham and his love for others and is one hundred percent human. Nephew Nick attempts to bring sanity into his uncle’s zany existence. It is he who attempts to blind-side the social workers, but Nick too has his problems trying to protect his uncle and be marching in that uncle’s zany band at the same time. In this cast he must be agile and resourceful and fills the bill. As for the social workers, Sandra (Rachel Bay Jones) being female, feline and given to tears and agile with the movements of a household pet and James Barry as Albert, buttoned tight into his clothes and his life, provide grist for the hysteria mill. In smaller roles Murray’s bother and agent Arnold (Andrew Polk) who attempts to introduce reality into Murray’s foibles but who is himself caught in the grubbing for money with awful TV mishmash, and especially Leo (Jordon Gelber) whom we first meet through his voice being thrown into a wastepaper basket. He has the awful physical girth to be terrifying as Chipmunk and is terrified of being drummed out of Murray’s life. This is a fun and funny play. All of these magnificent actors hurtle physically through the events that occur during the mad house that this play concerns. The props alone must have kept half a dozen apprentices on hand every minute backstage. And the stage had to whirl back and forth as zanily as the plot, to a different locale, or just to a different décor as the romance came and went. It was as whirled about as often as the charactrs were staring at the ceiling. This is a wonderful, hilarious play, beautifully presented; so glad I went!